For a dark and lustrous shine on darker colored and black paints. Chemical Guys Blacklight Hybrid Radiant Finish Car Wash Soap was designed as the perfect cleaner for black and dark colored vehicles. 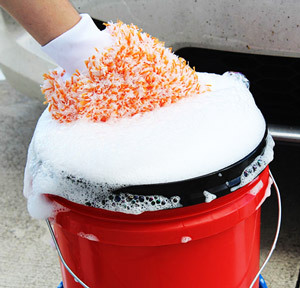 The high foaming, slick formula gently removes dirt and grime from your paint, safely and effectively. The pH balanced formula will not remove existing wax or coatings, making Chemical Guys Blacklight Hybrid Radiant Finish Car Wash perfect for coated vehicles. Engineered using advanced synthetic lubricants, hyper-surfactants, and gloss enhancers, Chemical Guys Blacklight Hybrid Radiant Finish Car Wash Soap emulsifies dirt and separates it away from the surface for a scratch-free shine. You’ve already lovingly tended to your black paint, why ruin all of your hard work in just one wash!? Chemical Guys Blacklight Hybrid Radiant Finish Car Wash Soap can be used in a foam gun or cannon as it produces copious amounts of foam that can cover your entire vehicle – perfect for presoaking before the scrub! 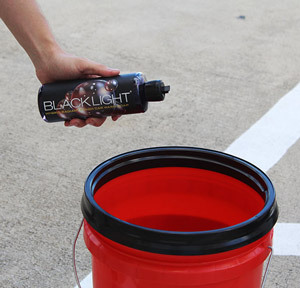 Chemical Guys Blacklight Hybrid Radiant Finish Car Wash Soap can also be used with the two-bucket wash method for a totally swirl free finish. Chemical Guys Blacklight Hybrid Radiant Finish Car Wash Soap creates mounds of suds that safely and effectively remove dirt, debris, and other road grime for a clean surface - on dark and light cars! Chemical Guys Blacklight Hybrid Radiant Finish Car Wash Soap will not strip any waxes or coatings you may already have on your surface. This maintenance product will leave only a clean (and previously protected!) surface behind!